So now, with a little more than a month before Donald Trump takes the oath of office as the 45th president of the United States, lets review just how many strings connect Trump to Russia. National Security Advisor appointee Michael Flynn has given a series of paid speeches at events in Moscow, including a speech at the anniversary party for RT, an English-language propaganda arm of the Russian government. He was photographed sitting with Putin following his remarks. Rex Tillerson, the CEO of ExxonMobil was announced this morning as Trump’s nominee for Secretary of State. Tillerson was Exxon’s man in Russia in the 1990s, forging close ties with Putin and Russia’s state-owned oil industry. He has lobbied hard against US economic sanctions against Russia following Russia’s invasion and annexation of Crimea. Those sanctions have cost his company billions in lost deals and contracts. Tillerson’s close personal relationship with Putin dates to 2011 when his company signed a multi-billion deal with the Russian oil giant Rosneft. In 2013 Putin himself awarded Tillerson the Order of Friendship, an honor given to foreigners by the Russian government. Retired Gen. James Mattis, Trump’s nominee for Secretary of Defense, while taking a tougher line on Russia than his potential boss, is considered by the Russians as more pragmatic than his predecessors, and combined with the other two rounds out a US national security team thought by Moscow to be highly favorable to Russian interests. Finally, we learned over the weekend that the CIA has concluded that Russia intervened in the presidential election in an effort to tip the scales in Trump’s favor, an intelligence operation ordered at the “senior-most levels” of the Russian state. The president-elect of course denies the charge, dismissing it as sour grapes from embarrassed Democrats who thought the election was in the bag. 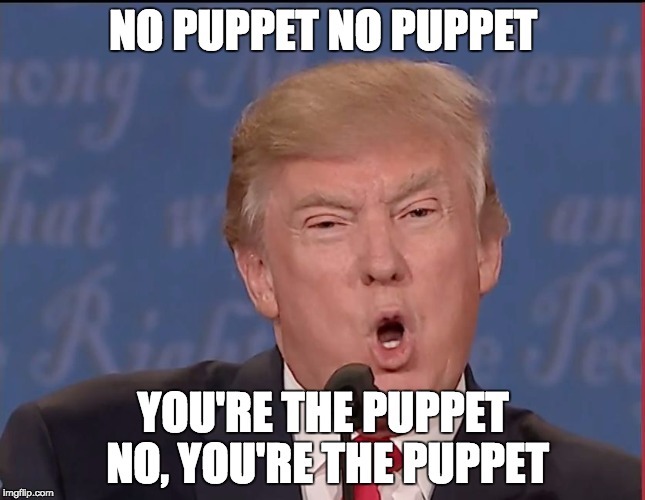 I think we know who the puppet is here. But don’t take my word for it, follow the links above and judge for yourself.